Royal & Langnickel brings together sleek design, convenience and portability with these great aluminum art sets. Each set features fundamental tools for endless experimenting and creating. This set includes a basic range of charcoal materials, great for figure or still life drawings and fantastic for the classroom. 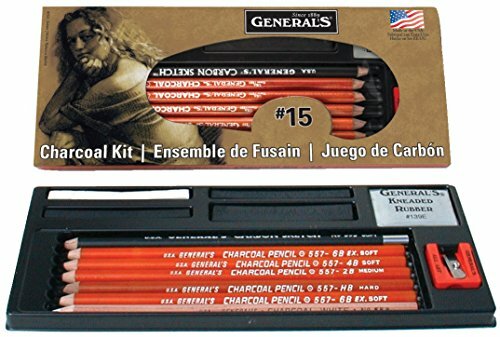 General's Charcoal Drawing Kit comes with 5 non-toxic, latex-free pieces, including three charcoal pencils (6B, 4B, 2B), one white charcoal pencil and one kneaded eraser. Eraser is perfect for fine work and for removing charcoal from areas. 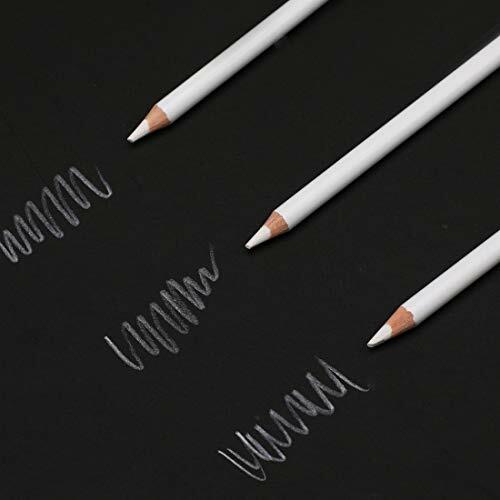 White pencil is ideal for highlights and works well as a wash-out pencil for marking on fabrics. 101 Textures in Graphite & Charcoal is a must-have resource for all graphite and charcoal artists. This guide provides step-by-step instructions on drawing key textures you'd find in any illustration. Accurately rendering surfaces and textures is one of the most challenging aspects of working with graphite pencil and charcoal. 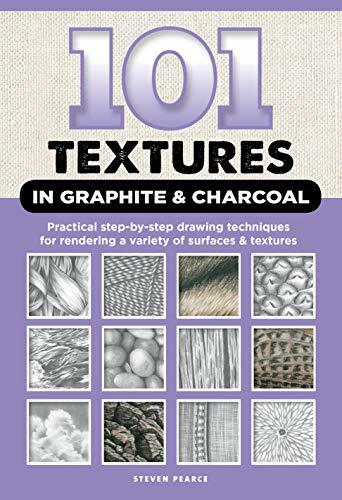 101 Textures in Graphite & Charcoal provides artists with step-by-step instructions for learning how to draw a wide variety of the most common textures and surfaces, including sand, water, metals, foliage, wood, fabrics, stone, grass, hair, and many more. Opening with a general introduction to basic drawing tools, materials, and drawing techniques, each page in this comprehensive resource features two to three easy-to-follow steps demonstrating how to create each specific texture. You will will discover tips and techniques for working in both graphite and charcoal and how to manage their differences when hatching, stippling, scumbling, blending, and more. With its breadth of coverage, easy-to-follow instruction, and helpful tips, 101 Textures in Graphite & Charcoal is a must-have resource for artists of all skill levels. This kit comes with a white charcoal pencil, five black charcoal pencils, two black charcoal sticks, a white charcoal stick, a black wide charcoal stick, a carbon sketch pencil, a kneaded eraser and a sharpener. Made in USA. 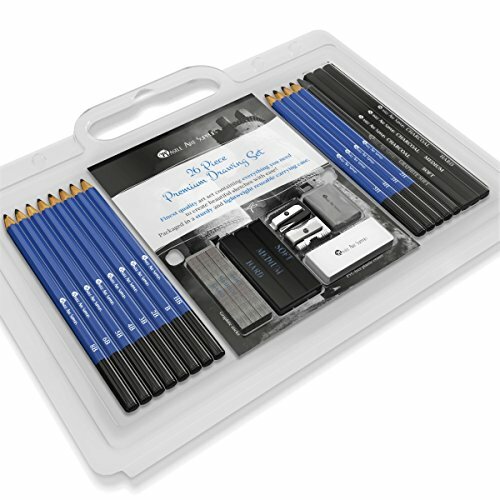 “The Original” Charcoal Drawing Pencil Set is a classic set that provides you with the basic necessities for charcoal sketching. 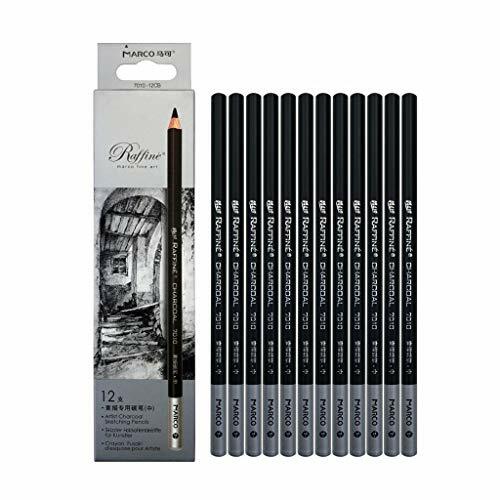 This set includes six charcoal pencils in a range of hardness, including a white charcoal pencil for highlighting, with a bonus carbon sketch pencil for layouts and a pencil sharpener. 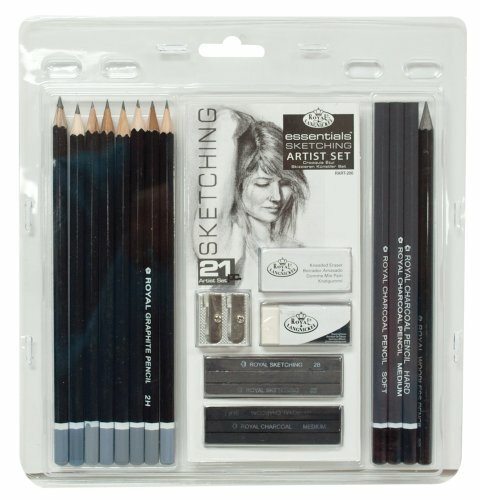 This high-quality set of charcoal drawing materials includes three Primo Euro Blend pencils, a Primo Bianco pencil, a Primo ELITE Grande pencil with an extra thick core and hexagonal grip, four Primo compressed sticks, and two different erasers - a Factis Magic Black Eraser and a soft kneaded eraser. 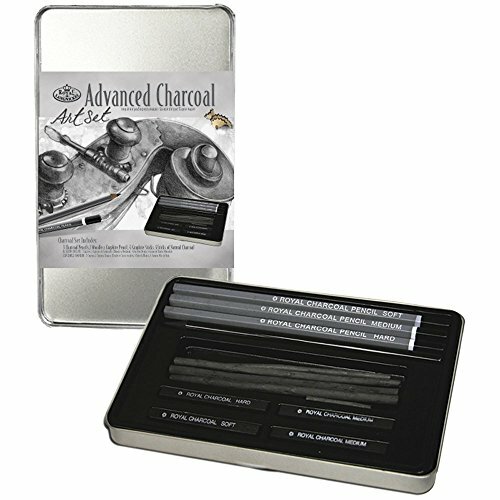 The rich, organic blacks of these tools achieve intense drawing tones and values, that can be used alone or in combination with other charcoal, graphite, pastels, or mixed media. 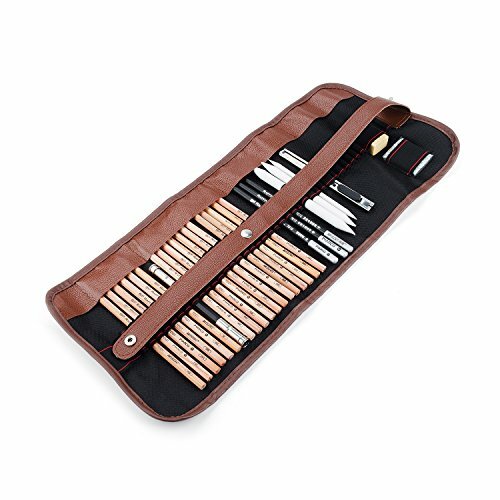 Charcoal Sketching Pencils Set 41 Pcs, Magicfly Drawing Pencil Sketch Set with Sketch Book, Kit Bag, Tools, Erasers, Professional Graphite Pencil Set For Shading, Sketching and Drawing Features: 1. SUPERIOR QUALITY SET: 12 graphite pencils (5h, 4h, 3h, 2h, hb, b, 2b, 3b, 4b, 5b, 6b, 8b) + 1 ultra soft all-graphite pencil + 3 charcoal pencils in soft, medium, hard + 4 Pastelgraphite pencil and 2 solidpencil + 1 pencil extender + 1 pencil knife + 1 case Charcoal Willow Sticks + 3charcoal sticks in soft,medium, hard + 1 graphite stick in soft,medium, hard + 1 paper bank + 1 white eraser + 1 kneaded eraser for erasing + 1 sharpener+ 1 two hole hardware sharpener + 1 sketch book + 1 case2. SAFE AND NON-TOXIC-All the Drawing Pencils and tools are detected, so you can buy it for yourself and your family3. PORTABLE WITH ZIPPER CASE: The portable kit bag that come with is perfect to use at home, school or in travel. It will keep all supplies in organized when not in use.4. WIDELY USE: This Magicfly versatile art kit is perfect for both students, hobbyists who love scrapbooking and even professional drawers working on craft or construction paper, detail sketching and high-level artistic skills, it is best tools to showcase someone's awesome drawing talent.5. 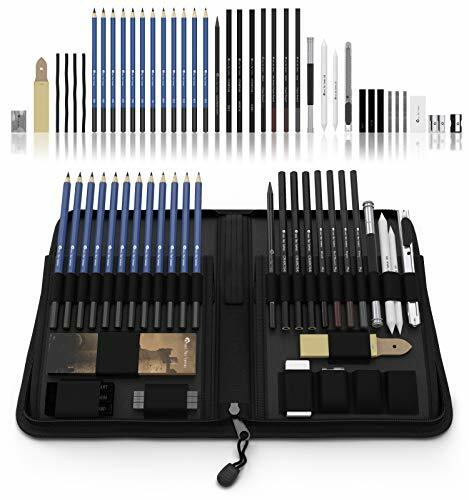 A GREAT GIFT: this 41 items pencil set makes it an excellent gift on Christmas, birthday or New Year's gift for your family and friend who love being creative in the art world. 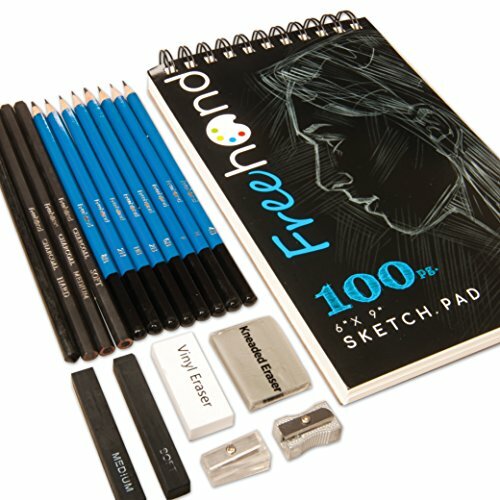 Quality guaranteed!This Magicfly 41 Pics Drawing Pencils and Sketch Set Packed with everything you need to go from basic outline to highly-detailed masterpiece, this travel-friendly art kit contains all the essential graphite, pastel and charcoal pencils to make drawing, shading, blending and sketching efficient and gorgeous.It is perfect for Draw, Sketch, Design. Whether you’re a beginner or a professional artist, just release the hidden artist talent, they are the best tools to showcase someone's awesome drawing talent. All you need to do is to put them in your hands and the miracle happens.Product Details: Precision, Pre-Sharpened Lead*Travel-Friendly*Beginner and Professional*Non-Slip Grip Pencils*Sketch, Draw, Color and Blend*Convenient Carrying Case and Sketch bookComplete Artist Set: 12 graphite pencils with superior quality(5h, 4h, 3h, 2h, hb, b, 2b, 3b, 4b, 5b, 6b, 8b)1 ultra soft all-graphite pencil3 charcoal pencils in soft, medium and hard4 Pastel graphite pencil2 solidpencil1 pencil extender1 pencil knife1 case Charcoal Willow Sticks3 charcoal sticks in soft,medium and hard3 graphite stick in soft, medium and hard1 Sandpaper pencil pointer1 white eraser1 kneaded eraser for erasing1 black plastic pencil sharpener( used for charcoal pencils )1 two-holed hardware sharpener( used for graphite pencils )1 sketch book(14.5*20cm 16pcs)1 nylon caseReturn policy: We strive to ensure complete customer satisfaction with every transaction. If you have any quality problem with the product within 90 days after purchase, you could contact us for a refund or replacement. 1-2 inches error of the measuring is a reasonable range due to different measurement methods. Pls confirm the size according to our description instead of the photos. Return by Dimensions problem is not accepted. If return for size, color, material or other reasons that not caused by quality problems, we're sorry that customer has to charge the return shipping cost. Items must be returned in the original manufacturer's packaging. We strongly recommend you keep your packaging for at least the first 90 days after purchase. This attractive Simply Charcoal Tin Set with removable lid holds versatile assortment of charcoal pencils and accessories. 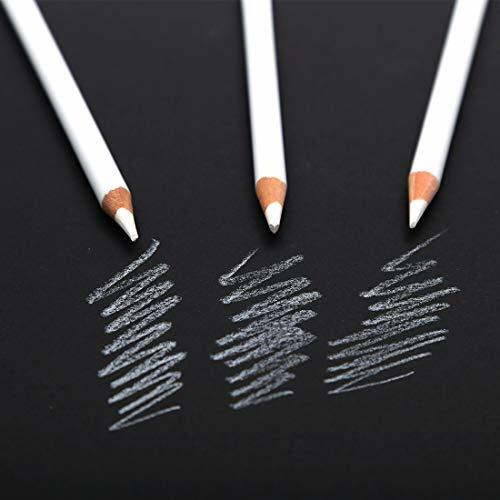 Sketch your subject with the selection of graphite and charcoal pencils and sticks, blending with the kneaded eraser and paper sticks to create a variety of effects and styles. 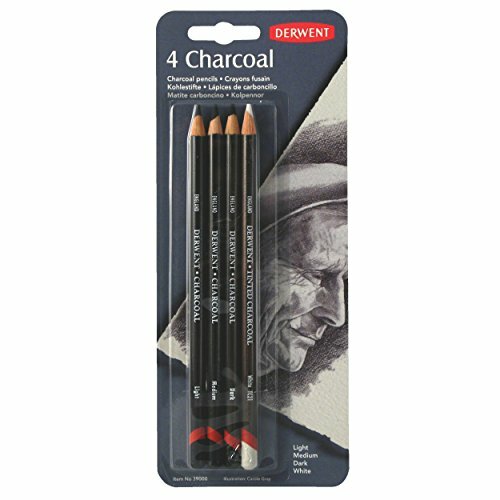 These tinted charcoal pencils combine the dramatic beauty of charcoal with a gentle hint of color. When applied the charcoal can be smudged and blended to achieve deep, rich tones. The pencils sharpen to a fine point for detail and are available in a variety of subtle colors including white for burnishing and highlights.The 6-Color Set includes burnt orange, forest pine, lavender, natural, ocean deep and peat. The 12-Color Set includes charcoal dark, dark moss, driftwood, glowing embers, green moss, lavender, mountain blue, natural, ocean deep, peat, sand and white. The 24-Color Set includes bilberry, burnt earth, burnt embers, burnt orange, charcoal dark, charcoal light, charcoal medium, dark moss, driftwood, elderberry, forest pine, glowing embers, green moss, heather mist, lavender, mountain blue, natural, ocean deep, peat, sand, slate, sunset pink, thistle and white. These extra large compressed charcoal sticks are rich, smooth and very black. Create dynamic drawings and loose, expressive sketches. This set features three 6B sticks. General's "Original" Charcoal pencils are handcrafted with an extra smooth, rich, intense black drawing formula. Oil free and blend able, these charcoal pencils are made with the finest organic blacks to create beautiful art renderings and mix-media art. 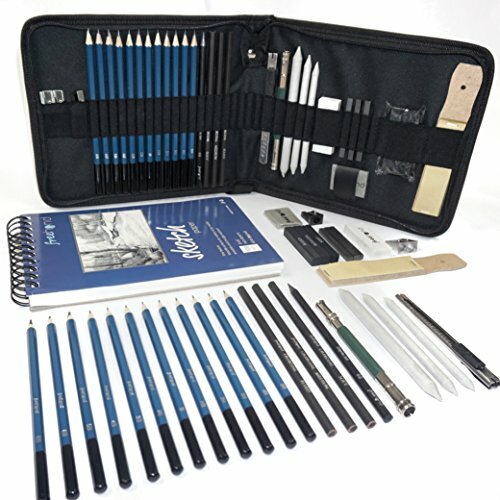 Ideal for drawing class, painting, sketching, still life and portraits. Additional uses: applying patterns on canvas and transfer a design or to draw directly onto canvas. Sold individually, order 12 for a full box. Also sold in a convenient pack of 2.